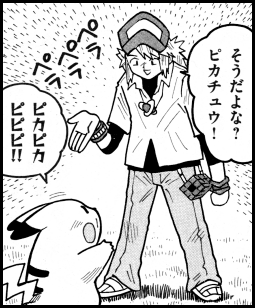 Araragi-Hakase is the first person Red, Pippi, and Pikachu come across in the Isshu region. She gives out pokemon to any trainer who comes to her laboratory. Araragi-Hakase is very sensitive about her age and will explode if she is ever referred to as an "old woman" (おばさん). Complimenting her will immediately snap her out of her rage, however. Araragi-Hakase first appears in Volume One, Chapter One of Pocket Monsters BW Version. Characters who seem to be based on Touya, Bel, and Cheren appear at Araragi-Hakase's laboratory to claim a pokemon. The three get into a fight when they can't choose which starter pokemon to get, but they are eventually calmed down by a speech from Pippi, of all people. The three appeared briefly in Volume One, Chapter One of Pocket Monsters BW Version. These three brothers run a restaurant that doubles as the Sanyou City Pokemon Gym. All three of them are known for being incredibly good looking and for never getting into arguments with one another. Pippi tries to get the three brothers to fight in an effort to mess up their teamwork, but all of his attempts are in vain. 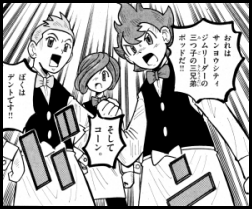 Pod, Corn, and Dent first appear in Volume One, Chapter Three of Pocket Monsters BW Version. N is a young man who's lived with pokemon ever since he was little. As a result, he's able to communicate with pokemon, even those who cannot speak human language. Pippi notices N's ability and decides to make some money off of it by secretly recording a conversation he has with his Choroneko. In the dream sequence that follows, the CD that Pippi makes from N's recording becomes a huge hit and earns him tons of cash. N angrily enters Pippi's office and demands he stop using his name and likeness without permission. 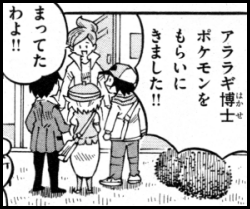 N appears in Volume One, Chapter Four of Pocket Monsters BW Version.